Classes are taught in a relaxed and friendly environment by our team of professional instructors, all of whom have undergone thorough training to ensure they can deliver to you the best in martial arts training. Each instructor is personally trained in Wing Chun by the School to ensure they are aware of the most up-to-date techniques currently being practised. Every instructor is competent and capable of giving you the exact training you require to meet your individual goals. They are also CRB checked for added peace of mind. “Great school for children & parents?? Kung Fu Schools is the only martial arts organisation outside of China to be designated a “Confucius Classroom” by the Confucius Institute of Traditional Chinese Medicine. Sanctioned by the Chinese government, the Confucius Institute recognises organisations that promotes health and wellbeing through the teaching of Chinese arts and culture. We work closely with the London branch of the Confucius Institute, based at the London South Bank University. We teach Wing Chun kung fu, the Chinese martial art made famous by the legendary Bruce Lee, as well as by recent biographical films about our late Grand Master Yip Man (or Ip Man). A traditional kung fu originating from the Shaolin Temple, Wing Chun is recognised as one of the most efficient self-defence systems around. Its emphasis on accuracy rather than strength makes Wing Chun suitable for men and women of all ages and fitness levels. “Since starting wing-chun with Keith at Kung Fu Schools Sutton I have been pleasantly surprised with everything. As soon as I walked into my first class I felt confortable and welcome and was really helped to settle in. I was also amazed at the amount of progression I made in a short space of time. After trying my hand at other martial arts, I am happy to say that I feel I have a home and a new family in Kung Fu Schools and cannot wait to see how I will progress in the future. Wing-chun has everything you could look for in a martial art; fitness, discipline, fun, and most importantly effective and easy to learn self -defence. With a specialised curriculum refined over the years, Kung Fu Schools teaches Wing Chun based on a comprehensive syllabus, aimed at effective learning and progression through our carefully structured grading system. Sifu Alan, a 3rd Degree, began his Wing Chun teaching career as an assistant instructor to Master Paul Hawkes, before opening Kung Fu Schools Croydon with a team of full-time instructors. After more than 12 years’ teaching in Croydon, Purley, Sutton, and Redhill, Sifu Alan was awarded his 'Sifu' title by Grand Master Keith R. Kernspecht in 2006 after successfully guiding his first students to their 1st Degrees. Today, he continues to take many people towards their 1st and 2nd Degrees. His younger students have appeared on BBC's Blue Peter, where they demonstrated their martial arts prowess to Jack Black of Kung Fu Panda fame. Sifu Alan himself has been interviewed on the BBC London news. Today, Sifu Alan continues to perfect his art. He has trained with Grand Master Leung Ting, Grand Master Kernspecht, and Great Master Cheng Chuen Fun. 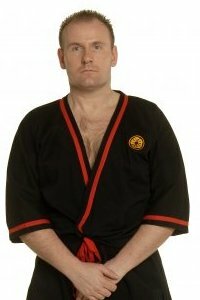 He currently trains with his sifu, Master Paul Hawkes, and his sigung, Grand Master Sergio Iadarola, head of the IWKA. His training takes him to various locations around the world, including Hong Kong, Italy, Germany, and Austria. Sifu Alan is also an instructor for Total Care Security, a company offering training in close protection, asset and property protection, and conflict management. With experience working in the security industry, Sifu Alan works closely with TCS, often travelling up to their Headquarters in Lincolnshire to work on close protection training. 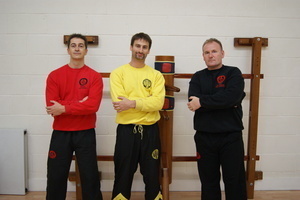 The directors of TCS, Chris Wheeler and Terry Cambridge, are Sifu Alan's private students. He has also run many self-defence courses for schools and vulnerable people. Chief Instructor of the Kung Fu Schools Organisation, Master Hawkes is a 5th Degree Wing Chun practitioner with 25 years of martial arts experience. He has trained under masters such as Grand Master Leung Ting, Grand Master Kernspecht, Master James Sinclair, Master Hans Peter-Edel, and Master Thomas Schron. His current sifu is Grand Master Sergio Iadarola, head of the IWKA. After many years as an instructor under various organisations, including being Chief Instructor of the EWTO-UK, Master Hawkes decided to set up the Kung Fu Schools Organisation. He travels frequently around the UK, Europe, America, Hong Kong and China to train and to research the origins of the martial art. The International Wing Tjun Kungfu Association, or IWKA, aims to disseminate the teachings of Wing Chun kung fu in its most original form. Led by Grand Master Sergio, the organisation seeks to rediscover the most authentic version of Wing Chun by tracing its history back to its first creators. Grand Master Sergio is arguably one of the top Wing Chun experts in the world. He has trained under notable teachers like Grand Master Leung Ting, Grand Master Allan Fong, and Emin Boztepe. In 2002, he founded the IWKA, and today continues to train under Grand Master Cheng Kwong. Grand Master Tang Chung Pak, Sifu Pak Cheung Kau and Sifu Sunny So. Kung Fu Schools is proud to be affiliated with the IWKA, regarding it as our big brother organisation.